A friend writes to remind me that, aside from a brief census blip in 2010, public sector jobs (state+local+federal) have steadily declined during the Obama administration. 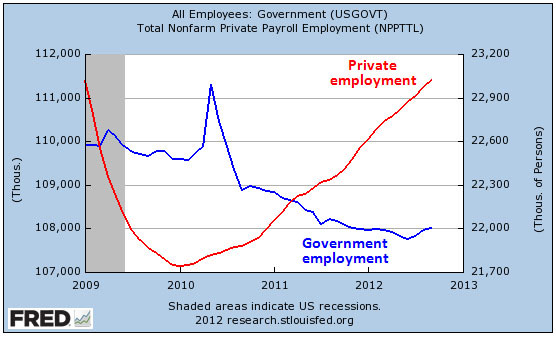 At the same time, private sector jobs bottomed out at the end of 2009 and have been on a steady upward rise ever since. “The government sector drag pulls the total down,” she says, “which should be appreciated by small-govt loving Republicans.” It should be! Over the past four years, government has gotten smaller and the private sector has become a bigger and bigger percentage of the workforce. Conservatives ought to be pretty happy.